Youth ERA takes a proactive approach to youth suicide prevention, giving young people a positive space to build friendships and connect with young adult staff who can help them with depression, thoughts of suicide and other challenges. Simon Hobson didn’t know what to expect when employees at Salem’s psychiatric crisis center referred him to Youth ERA. After graduating from high school in Turner last year, the 18-year-old was struggling with post-traumatic stress disorder and thoughts of suicide. He had been in and out of crisis by the time he walked into the organization’s drop-in center on State Street. There, instead of a sterile medical environment, he found comfortable couches, a computer lab and a stage with speakers. “I was like, this is okay. They have a pool table,” he said. With brick walls decorated with succulent plants and photos clipped to thin wire, the downtown drop-in center looks more like a trendy café than a mental health program. Youth ERA is a Eugene-based nonprofit organization focused on youth suicide prevention, improving teens and young adults’ mental health and helping them achieve their goals. Suicide was the second leading cause of death for young Oregonians between 10 and 24. In 2017, 107 young Oregonians took their own lives, and 750 were hospitalized for a suicide attempt or self-inflicted injury, according to the Oregon Health Authority. Rates of suicide among Oregon youth have climbed significantly since 2011, and are higher than the national average. Youth suicide has been discussed more in the Salem area over the past year, especially after two Sprague High School students took their own lives at the start of the school year. The Youth ERA strategy? Hire young people, between 20 and 30, who have their own experience with struggles like depression, attempted suicide, and sexual assault and let them build relationships with teens who walk in the door. It’s a proactive approach to suicide prevention. By giving young people a positive space to build friendships, Youth ERA helps head off feelings of depression and isolation, which are common in teens who do attempt suicide. Teens can also connect with young adults on staff and have one-on-one conversations with them about anything they’re going through: breakups, losing housing, or struggling with thoughts of suicide. “You don’t have to sit here and explain everything to me about being suicidal because I’ve been suicidal in my past,” said Jammie Gardner, chief operating officer. The Salem drop center is open weekdays from 3-6 p.m. and serves as a low-pressure way for young people from 14-25 to connect with staff and each other. It opened in the spring of 2018 and has served 151 young people. The center is funded by the Mid-Valley Behavioral Care Network at $279,000 per year. Hobson was one of about 10 young people spending the afternoon there on a recent Monday. He arrived with his skateboard, showing a new tear in his jeans – and bleeding knee – to the staff. While an enthusiastic group of teens watched the third season of Glee from a couch, Hobson sat at a table with a friend, doodling on a pink Post-It note. He said Youth ERA has become a big part of his support network. Through the drop center, he’s made friends he spends time with regularly. He’s also connected with staff who can help him if he’s in crisis. Hobson said in the past, he’s called a suicide hotline when he was struggling with wanting to take his own life. But those calls can be frustrating. Hobson was attending classes at Chemeketa Community College after graduating, but stopped so he could focus on improving his mental health. He said he used to sit in class and feel alone, like no one else was going through the same challenges he was. Talking with other young people at Youth ERA has shown him that’s not true. Gardner said many efforts to prevent suicide or address mental health in teens urge teens to talk to their parents or other adults. That’s not a bad thing to suggest, she said, but it ignores research showing that teens mostly lean on friends for support, even when problems are serious. “Developmentally, you are going to turn to peers,” she said. Juanita Aniceto, a 25-year-old peer support specialist, has represented Youth ERA at evening conversations the Salem-Keizer School District began hosting at local high schools following the suicides at Sprague. She said the discussions have been positive, with parents showing interest. But, like many efforts to prevent youth suicide, they’re largely led by adults. She wants young people to know that “there’s more out there than just professionals with a badge” to talk to about suicide and mental health, she said. 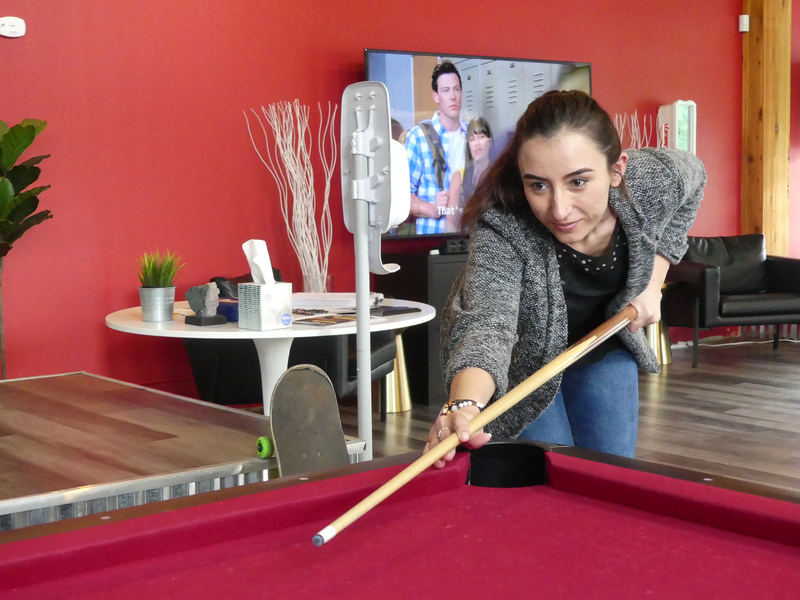 Her job sometimes involves playing pool or talking about TV shows with young people. But she’ll also have one-on-one conversations with them outside those hours about issues they may not want to broach with parents or school counselors, including struggling with depression or not having housing. “They might not feel comfortable with counselors or doctors,” she said. 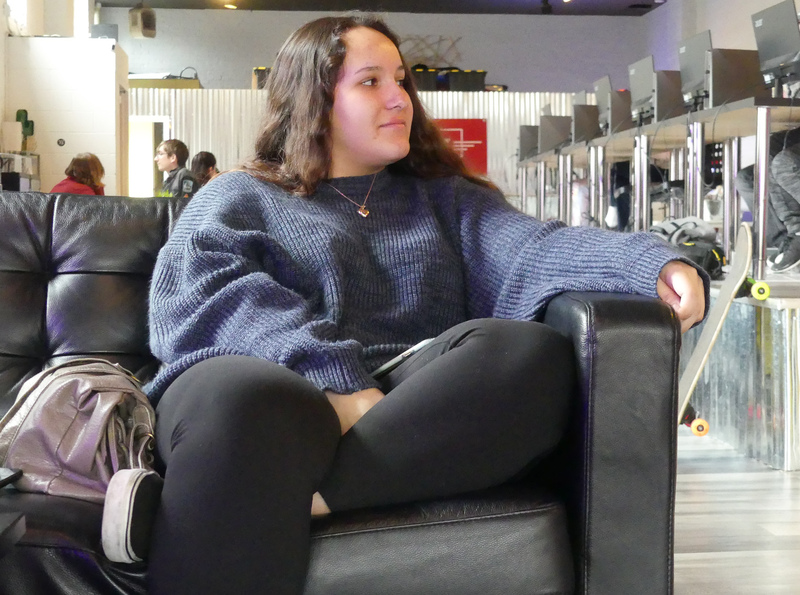 Sam Mota, 18, walked in to the drop center off the street one day because she was curious about the building. She moved to Salem with her moms a year ago from the Los Angeles area and said she struggled with isolation and depression from not knowing anyone. “If I hadn’t met Juanita, I wouldn’t have the right support that I needed,” she said. She described Aniceto as a supportive older sister. Mota said she’s found community and friends through drop center, where it’s easier to strike up a conversation over a game of pool or while watching the same show. One of her newfound friends is going through a challenging time in her life, and Mota will drive over to help her out when she needs support. Youth ERA isn’t just a place for friendships and mental health support. It’s also designed to help young people figure out what they want in life and take steps to get there, whether that’s work, more education or something else. Mota said Aniceto helped her work on her resume to get local jobs and helped her apply to a community college in California, where she’s hoping to study psychology and eventually become a therapist for children and teens. Gardner said the focus of Youth ERA’s work is to talk with, not at, young people. That means getting input about what programs or equipment they’d like in the center, and helping them make that happen. A recent effort yielded a small windowsill garden in half a dozen pots. Program employees have work accounts on Instagram, Snapchat and Facebook Messenger, the social media platforms young people are most likely to use, Gardner said. Teens will seek staff out and add them, and staff can reach out if they see someone posting about struggling or joking about suicide and ask if they want to talk. Sometimes, young people will message them directly to talk about problems. “Lots of times, social media is the gateway,” said Caitlin Van Wagenen, the group coordinator in Salem. Van Wagenen came to Youth ERA after working in hotels. She had a relatively stable childhood, other than her parents’ divorce, and felt like she’d been set up for success. But when she went to college at 18, she “felt like life fell apart” and found herself dealing with anxiety and depression. “I didn’t feel like I had anybody to turn to,” she said. She talked to college counselors, but found they weren’t very supportive. “They would be like, ‘Well, if you want to drop out, here’s the paperwork,’” she said. Van Wagenen graduated with a degree in hospitality management from Cal Poly Pomona and went to work in the industry, but soon found many staff there were struggling with mental health, and there was little discussion about it. She decided she wanted to do something different and moved to Coos Bay, where she began working at Youth ERA’s center there. Now, she’s trying to help other young people build the skills they need to navigate difficult transitions in life and understand that those transitions may be difficult. “Being okay being uncomfortable is something I talk to a lot of my youth about,” she said. Hobson said he’s been more stable since he found Youth ERA. His mental health is still a challenge, but he feels like he has a place to help him work on it. “Coming here kind of gave me something to look forward to,” he said. ABOUT THIS PROJECT: Newsrooms across Oregon this week are sharing the results of a unique collaboration to delve into suicide and suicide prevention. Each newsroom acted independently but shared research on aspects of suicide. All of the coverage through the week of April 7 can be found at breakingthesilenceor.com.